Integrated RFID protection against data theft. Despite its large capacity, the 2cm (0.8") flat zipped wallet takes up little space. Made of light, durable 210D polyester. The compact travel organiser with RFID protection against data theft. 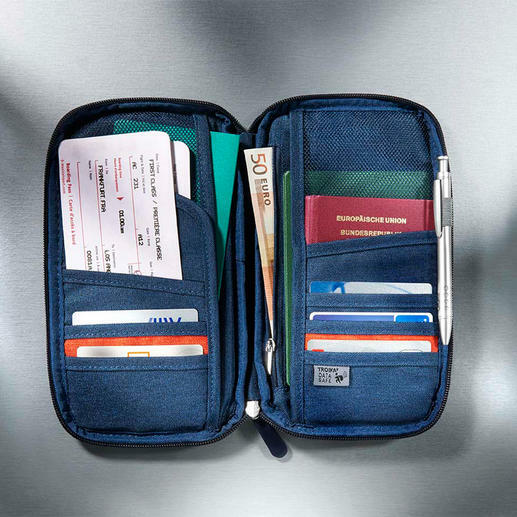 Never have to search again: At the airport, hotel lobby, on the train, ... You will have all your important items in one place and to hand with this compact travel organiser. 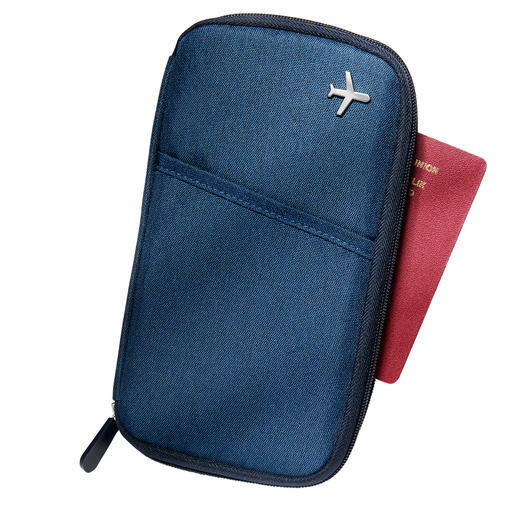 Tickets and boarding passes are easily located in the 15cm (5.9") deep outer pocket. 8 slots on the inside offer a neat space for passes, driving licence, ID card, ... 3 large side pockets (one with zip fastener) store money notes and receipts in an organised manner. An all-around integrated protection foil shields your cards securely from RFID reading devices. Nobody can spy on your ID card, bank and credit cards when passing by. You can easily put your organiser into your handbag or briefcase, in your backpack or even in the inside pocket of your coat. Seams stitched with strong twine, inner pockets reinforced with welted edges. Strong 3-side zip fastener. Wipe clean with a moist cloth. Size 24 x 13 x 2cm (9.5" x 5.1" x 0.8") (W x H x D), weight only 145g (5.1 oz). Very useful bit of kit. Bought as a replacement to an old, tatty travel organisor. Nice size and can fir all I need in it for travellling. A good buy.